Figs B13.17, 20, 22, 24, 48–51, 65, 76; C92.1–14. Species recognition. This species typically has a diamond-shaped basomedial black mark on tergum 1. 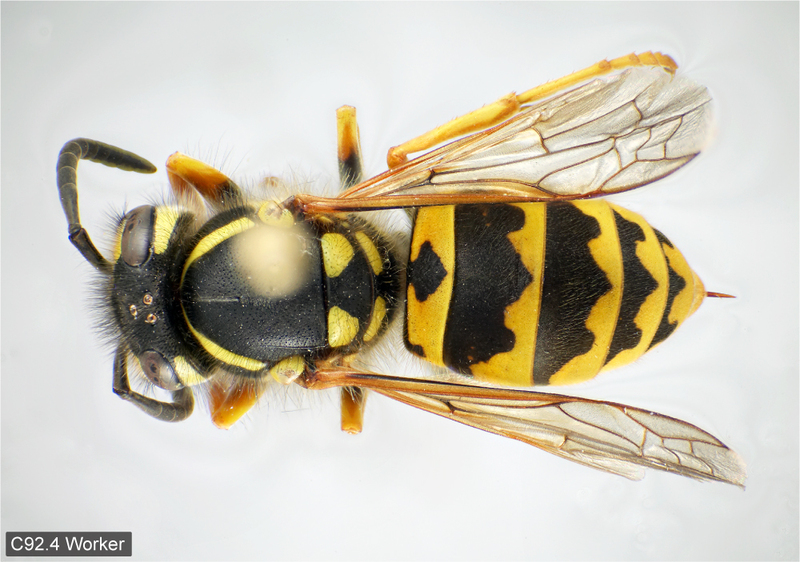 The adventitious V. pensylvanica is very similar in this respect but has yellow eye loops. The basomedial mark is narrower (at most twice as wide as long) than in V. maculifrons and usually has a narrower basal attachment than in V. flavopilosa. 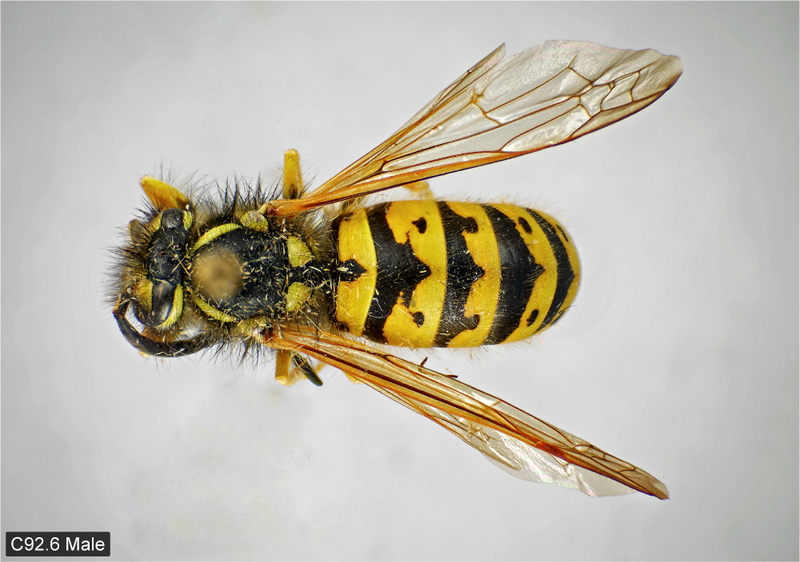 Melanic workers of V. germanica are similar to some xanthic V. maculifrons, and normal workers are difficult to separate from very xanthic V. flavopilosa. 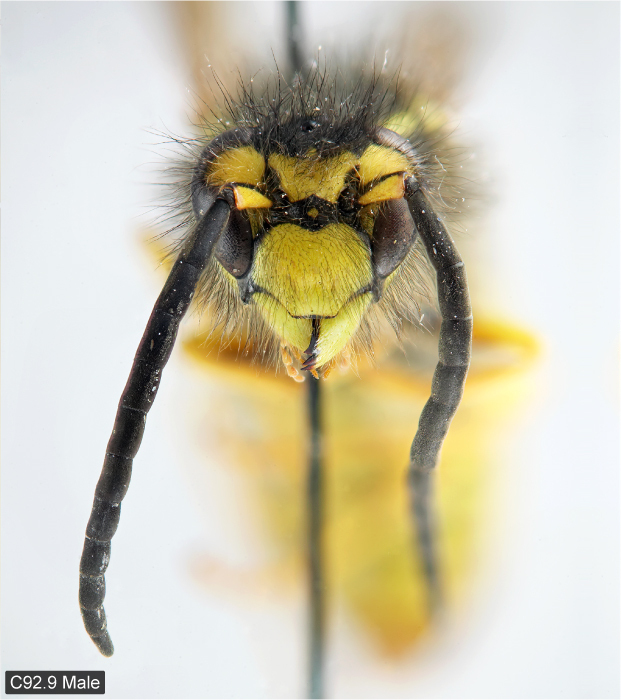 In both cases the absence of yellow spots or deep dorsal emarginations in the black subantennal mark is diagnostic. 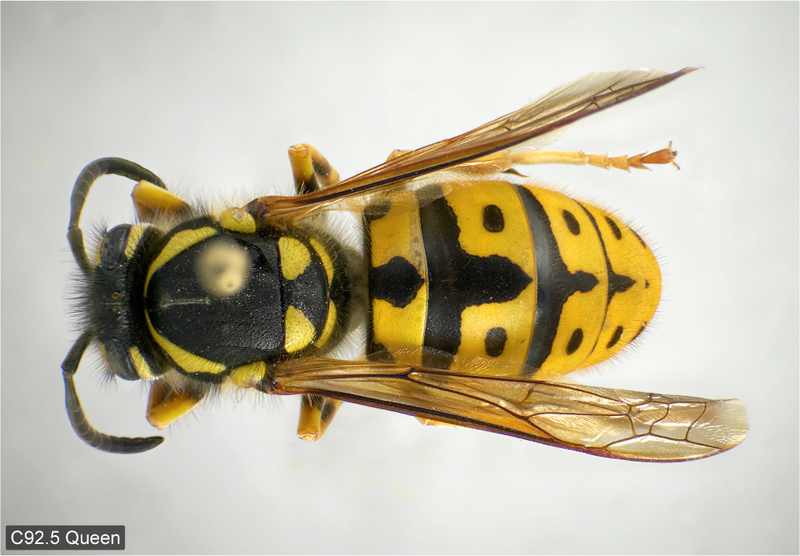 The males of V. germanica and the western V. pensylvanica are the only species in the genus with dorsoventrally inflated apical portion of the aedeagus (see key for diagnostic differences). Variation. 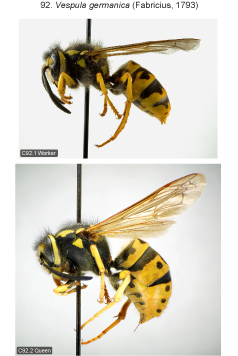 Fore wing length 7.5–12.0 mm (workers), 13.0–15.0 mm (♀♀), ca. 12.0–13.0 mm (♂♂, n = 7). 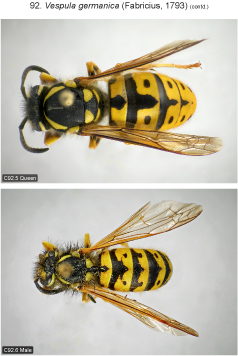 Clypeus of queen usually with three small black spots, sometimes with two spots and a more or less parallel-sided mark connected to the dorsal margin of the clypeus; worker similar to queen but sometimes only with one small median spot; male clypeus with 0–4 small black spots. Black band between corona and ocular sinus rarely interrupted in worker, often in queen and male. 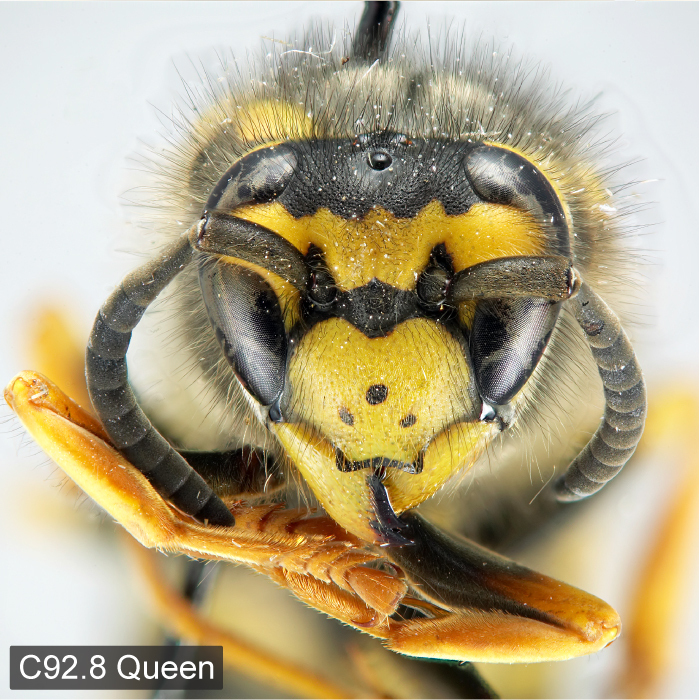 Black subantennal mark lacking yellow spots or deep dorsal emarginations in worker, 2(–3) spots rarely present in queen, one median spot present in one male. Scape black, in male always, in workers very rarely with yellow anterior mark. 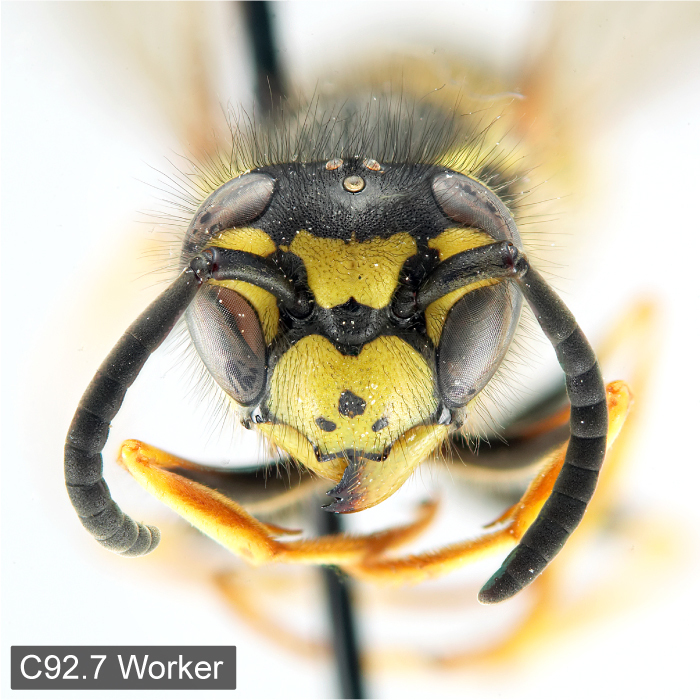 Xanthic workers sometimes with broad pronotal stripes and small yellow spot on upper metapleuron. 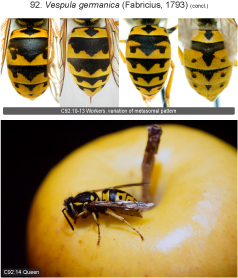 Propodeum with a pair of yellow spots in worker and rarely in queen, absent in male. Black basomedial mark of tergum 1 diamond-shaped to arrow-shaped, its width ranging from shorter than length up to (rarely) twice its length; width of basal attachment 1.2 to nearly 3x mid ocellar diameter. Discal spots of tergum 2 in worker often connected in a characteristic cross-bar manner to median extension of black basal band (not found in any other species). Terga 2–5 with or without paired, free, black, discal spots. Distribution. Introduced in Nearctic region. Canada: QC, ON and MB. U.S.: VT to MD, west to WI, MI, IN, OH and PA, also in WA and CA. Europe and North Africa to eastern Siberia, China, Korea, south to Israel, Iran, Afghanistan, Pakistan and northern India. Introduced in Iceland, New Zealand, Australia, Ascension Island, South Africa, Chile and Argentina (Carpenter and Kojima 1997). 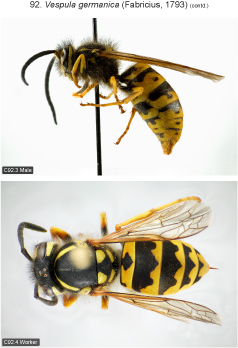 In North America this species was first collected in 1891 at Ithaca, New York (Menke and Snelling 1975). 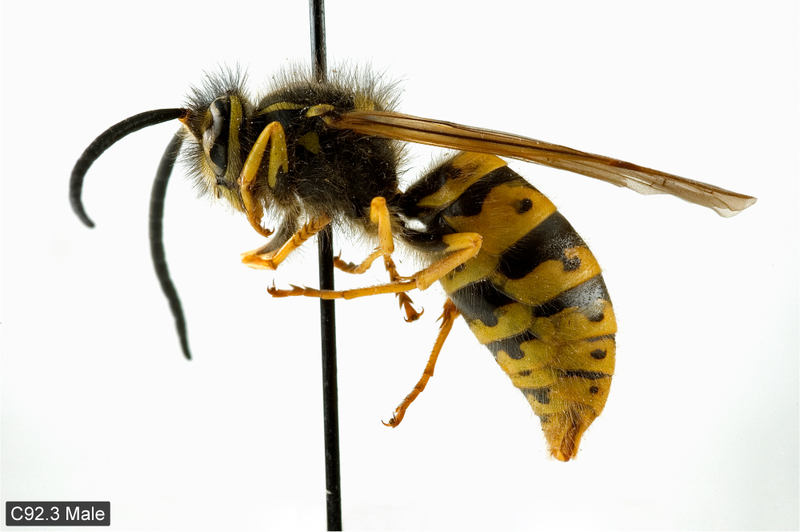 It remained rare and did not spread significantly until the late 1960s, when it entered a period of rapid range expansion. 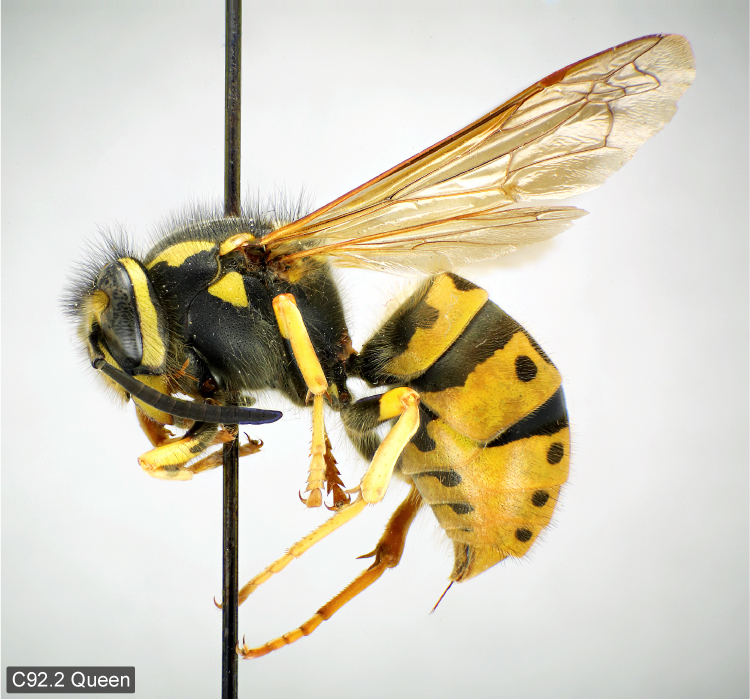 Vespula germanica was collected for the first time in Ontario in June 1971 (4 workers, Harrow, DEBU). Within only a few years it became widespread in the southern part of the province. The first record from Manitoba is from September 1976 (Galloway and Preston 1982). Biology. 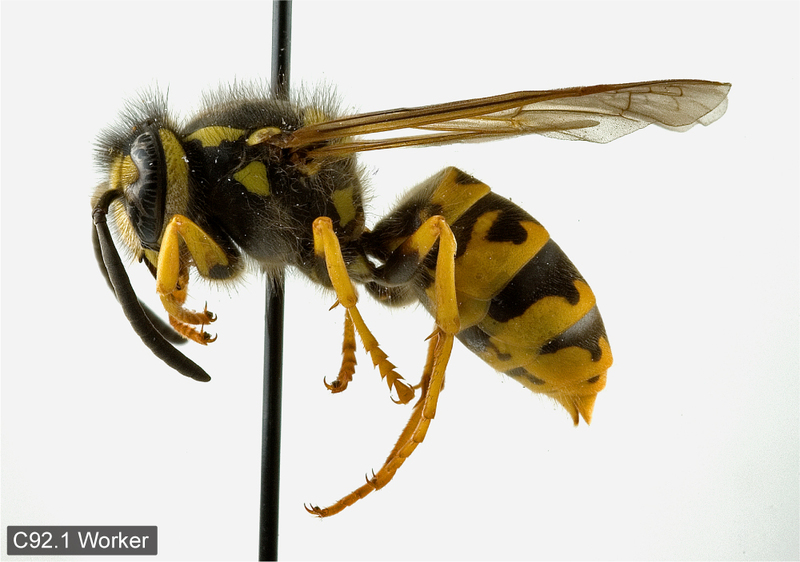 Nest are usually subterranean but are also built in hollow walls, in roofs, attics, etc. 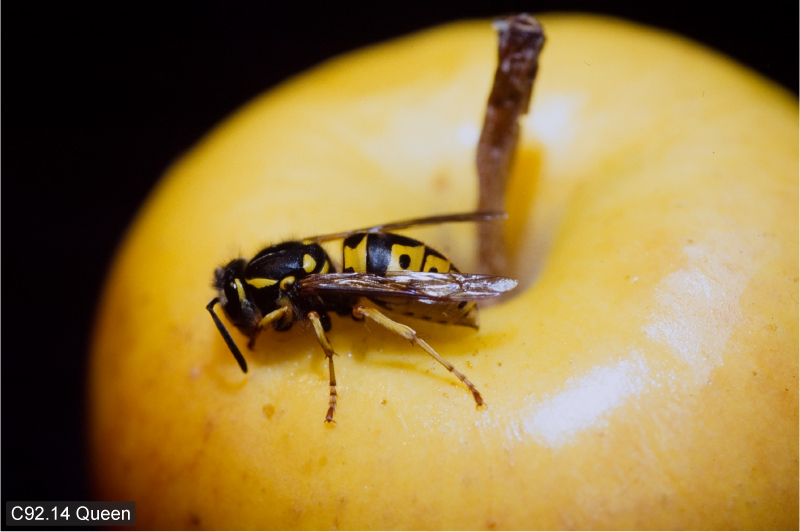 Prey consists of a wide variety of arthropods; in addition females scavenge on carrion and meat. 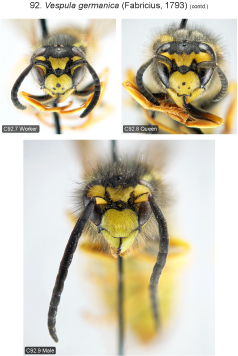 Vespula germanica and V. maculifrons are the most common pest yellowjackets in the northeast (Akre et al. 1981).